I like making things. It's such a sense of achievement when things turn out right. Over the years I've discovered that there is nothing like having the right tool for the job. I also don't mind spending money on good quality tools that last. 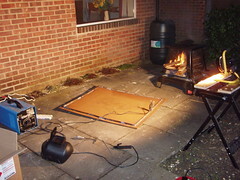 After going to some effort to get advice from the 'experts' at B&Q (the UK equivalent of Home Depot), I was advised to buy a small table saw to cut the big sheets of plywood I'd be using. It's the blue thing in the middle of the picture. In the event that proved hopeless, if not downright dangerous. Next I tried a jigsaw (after more expert advice), which you can see in the front right of the picture, which did the job, but it was almost impossible to get a straight edge good enough to use. For now, I've settled on a Black & Decker power hand saw which, although slow, cuts a neat line exactly as I want it. You can see it lying on the piece of plywood I've just cut. It also, rather handily, doubles as a jigsaw. After looking at the Black & Decker website, I'm thinking that maybe a circular saw would be even better. Anyway, that table saw is going back to where it came from. I'm pretty annoyed at being given such shoddy advice by people who should know better! Good news.... Lady Jane is still afloat after some fairly major surgery. Plenty of preparation had gone into the whole project, including the careful cutting out and marking of plate and lifting points before starting the committing job of cutting into the hull as soon as the tide went out. In the event, the cutting of the old and welding in of the new went surprisingly smoothly. 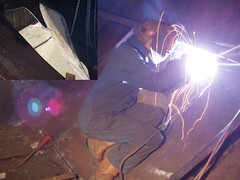 The picture shows Robin putting in the final strech of weld, with the inset showing the old section of plate being lifted out. Update: Note that the inset in the picture shows the plate that was cut out, the replacement plate is what Robin is standing on, while he finishes welding the top section in. Taking a shower now would be a bit tricky. In the picture you can see through into the engine room, the stern accommodation space and, right at the back of the picture, into the galley. It looks bad, I know, that's because it really is that bad. There is still more cutting of rusted plate from the side of the engine room to go before we can start welding the new steel in place. With the new steel in place I will at last be able to start the completion of the shower room, including a working hand basin, mirror and shelves. It will all be worth it, once it's all done. What else would we be doing on cold, rainy days anyway? Mary helped with rust busting. It proved to be a long, tiring, day with good progress made in preparing the aft accommodation space for rust treatment and painting. 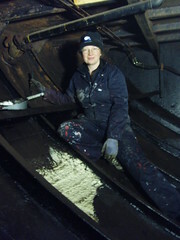 I'm only sorry that because of the cold, wet and windy weather, Mary's introduction to working on Lady Jane was deep in the bowels of the boat, rather than working on nice sunny deck projects. Still she said she enjoyed it, which is the main thing. 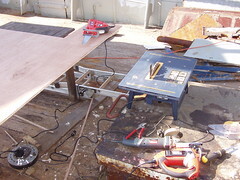 Here you can see my home 'office', where work on the hatch cover is progressing exceedingly well. The outdoor fireplace, which you can see has a fire burning merrily inside it, helps to keep me warm when working outside on cold evenings. Thanks to Linda for kindly returning it after all this time. 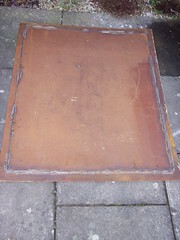 The hatch cover now has the last of the main pieces tack welded in place. I need to buy some clamps to ensure the steel plate is flush against the edges I'm welding, and some more welding rods to get this part of the job done. The last bits to do will be to weld a handle and catches on, so the cover can be sealed, paint the whole thing, then put a rubber strip inside the channel I've welded. This will hopefully make the main deck hatch watertight. Ultimately, this will all be redundant as I start to build forwards from the current wheelhouse block. But something needed to be done and this exercise has helped to build my confidence with cutting and welding projects. I've finally got around to making some progress with the hatch cover. Welding the thing is taking much longer than I thought it would, plus the whole plate seems to want to bend upwards so I'm not sure how this will finally finish up. It's a real pleasure to be actually making something for a change, rather than finding more rusted bits. I've still got a long way to go before this will be watertight though. Nothing is as straightforward as it seems. 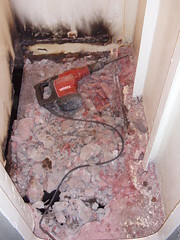 Here you see my progress in breaking out all the concrete from the shower room floor. Following on from my 'two steps forward' post, it turns out that the steel below the concrete which made up the shower room floor is completely rusted, and must have been for some time, as with all the concrete removed an over plated section of steel is visible. The holes you can see in the foreground are through to the engine room. What should have been a relatively straightforward cutting of the steel around the bottom edges of the shower room floor has evolved into the replacement of the underlying shower room deck as well as the bottom edges. There is a silver lining to this particular cloud, as without the concrete I'll now be able to shower standing fully upright. When everything is completed that is. I've not really said too much about the muddy swans just recently. Here they are, George & Mildred with last year's cygnets Dib, Dab and Dob, fit, fat and flourishing. The bloke you can see in the picture with the swans is a regular on the creek. 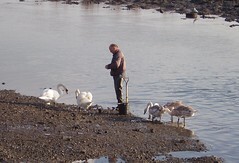 He digs for bait for the local fishing shops, lugworm and the awful ragworm (worm's aren't supposed to bite) are what he and the swans are after. He says he has been feeding the swans for years, they hang about and wait for him when he's about. They don't do that with any of the other bait diggers I see about the place. Time is flying by so fast, it's getting to that time of year when George and Mildred will start nesting, so I'll need to be finished working up forward, near the nest, so as not to disturb them. 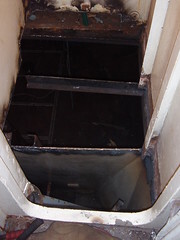 The picture shows the dodgy section of hull in the aft accomodation space I posted about in January. What I've done is taken a series of thickness readings, using a Cygnus 1 ultrasonic thickness meter, so as to gain a picture of the overall state of that section of steel. If you click on the picture, you can see the thicknesses in milimetres written in chalk on the plate. Bear in mind when you look at this, the hull readings I've taken elsewhere on Lady Jane mainly read between 8mm and 9mm. As a result of the readings, and some lengthy discussions with Robin, I've finally decided to bite the bullet and cut out the section of plate that is below 7mm thick, and replace it with new 8mm steel plate. To do this, we will probably need to cut away both of the ribs, then replace them afterwards. What will make this job particularly interesting is that all of the plate that needs replacing is below the waterline, so we will need to start this once the tide goes out and, more importantly, have the new plate welded back in place before the tide comes back in again. The consequences of this job going wrong does not even bear thinking about. Two steps forward, one step back. That's progress on Lady Jane through and through. 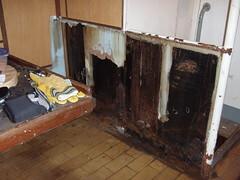 The picture shows where I've had to strip away more of the internal cladding in the galley. This is so we can get to the rusted steel at the bottom of the shower room to replace it. Those of you who have been to Lady Jane will note that I've had to take out one of the bench seats. At first it seemed like a bad move, though now I've done it I'm quite pleased, as it has freed up a substantial amount of space. Now I'll need to buy a few cheap chairs for guests to sit on until the galley is fitted out properly. I'm pretty pleased with the progress I'm making in making the wheelhouse more comfortable to stay in. What is really amazing me is just how much material, in terms of insulation and wood, just this small bit of the boat is consuming. Once I start this process for real in the aft accommodation, which is a much, much bigger space, I fear I'm going to be haemorrhaging money. 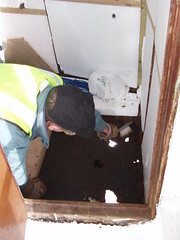 Here you see Malcolm sweeping up the last of the chunks of rust from the wheelhouse deck. Yup, those are holes through to the outside and to the battery room space. Just some simple cleaning up serves to remind me just how much work there will be to do when I get around to sorting the place out properly. For now, the holes will be covered over with plastic sheeting and conveniently forgotten about. I've enough to worry about elsewhere. I've made a start on re-instating the galley roof. Malcolm has been of great help in actually getting this task going, by scraping the rust off of the deck head. Not too pleasant a job, it has to be said. 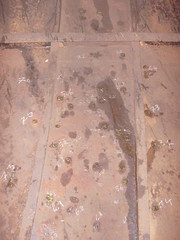 The picture you can see is the deck head after a coating of Rustroy, which converts the rust and makes a good surface for subsequent layers of paint. Next will be a few coats of bitumen paint, too keep the rust at bay a little more permanently. This is really only a temporary fix, as the whole galley space needs to be refurbished properly at some point. 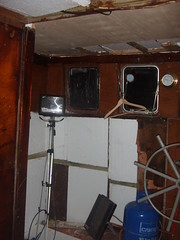 With the galley ceiling finally in place, I'll be pleased for the end of condensation dripping down the back of my neck. Here is the Wanderbird, which I've posted about before. The Wanderbird is very similar to Lady Jane in many respects, right down to the type of engine, and in so many emails - Rick and Karen have mentioned a sense of deja-vue when looking at my blog entries. Today's big news is that I've been in contact with captain's Rick and Karen, and between us we have arranged for me to go out to visit them next month while they're still at their winter berth. The plan is for me to help them with the refurbishment of their wheelhouse, a project I'm really looking forward to being involved with. It will be so good to finally meet Rick and Karen, and to gain an insight into how they have achieved all they have done on the Wanderbird. 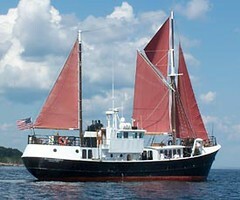 For example, look at the lovely galley and cabins they have on board. Lady Jane is more like a big workshop than anything else at the moment. Nobody, not even in their wildest dreams, could call it homely right now. While the outside is looking better and better, there is a big mess of tools, paint, materials, rust and stuff inside. What I'm finding is that now it's winter, and cold, I'm spending my time focused on tasks such as scraping, bashing, painting and the like, then going straight back home in the evenings to somewhere warm and comfy. I go to the boat with a specific goal in mind and work almost single mindedly to achieve it. As a result, the 'big' stuff is being done at the expense of the smaller, but no less important, jobs such as keeping the living areas of the boat clean and tidy. Now I'm trying to go down to Lady Jane the evening before a full boat day, spending this time making staying on board that much more pleasant. It's a bit of a chicken and egg situation, as making Lady Jane comfortable to live on in the cold is no trivial task in itself. I'm working on getting the wheelhouse insulated, clean and cozy first, though this is very much a temporary bodge as there is some serious work to be done here when I get round to it. 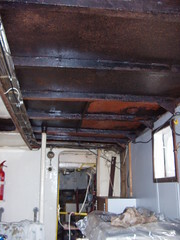 I also need to get the ceiling in the galley re-instated, so I stop getting rust flakes in my corn flakes.